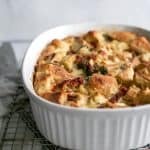 This Everything Bagel Breakfast Strata is the perfect brunch recipe. Made with feta, white cheddar cheese, sun dried tomatoes and basil, plus lightened up with non-dairy milk. Vegetarian recipe. Bake bagels if not dried out enough: Preheat oven to 300ºF and get large rimmed baking sheet out. Slice bagels in half; place on sheet and bake for 5 minutes. Remove from oven and let cool slightly. Place bagels on cutting board and use large serrated knife to cut into 3/4″ cubes. Save any bagel seasoning that falls off to add to egg mixture later. In a large bowl whisk together eggs and milk; stir in grated cheddar cheese, feta, sun dried tomatoes and basil. Add 1/2 of the cubed bagels to greased baking dish and pour half of the egg mixture over bagels. Then add the remaining bagels and egg mixture. Press down into the mixture to ensure the bagels are covered. Cover dish with wrap or lid; refrigerate for at least 6 hours, up to 1 day in advance. Remove baking dish from fridge and press down mixture again if needed to make sure bagel tops are coated. Preheat oven to 350ºF. Bake breakfast strata for 40-50 minutes, until edges are golden. Allow dish to rest for 15-20 minutes before serving. Enjoy! Whole milk or half and half is traditionally used in strata. It will give it a little bit of a richer texture, but non-dairy milk like cashew will lighten it up a bit. I used a 2 quart casserole dish and my strata needed about 50 minutes. If using a large dish like a 9×13 size, your strata may take less time.